Rita Becerra’s clemency petition was tragically denied on August 8, 2016. CAN-DO wants accountability and transparency with regard to why first offenders were passed over in favor of repeat offenders, especially when the applicants are women with perfect prison conduct and programming who have served 10 years or more, such as Rita Becerra. 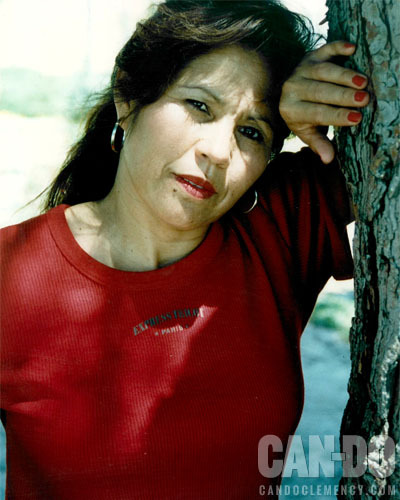 CAN-DO is communicating with Rita who is currently facing deportation, yet another hardship, as she has no family in Mexico. She came to the United States when she was 12 years old. Prison Conduct: Petty stuff like leaving a cup on top of her locker, giving an inmate money, Basically, Rita is a role model inmate. Additional hardship: Will be deported with no family members outside the U.S.
*Taught ESL for 6 years. Clemency: Filled out the survey for Clemency Project 2014. Recently received a letter of denial based on her release date in 2017 stating she was getting out soon and doesn’t qualify! I am a first time offender with not even a traffic ticket. I did hair for 21 years as a single mother and met a guy at the beauty shop. We started going out and after a year we started living together. He did not sell drugs when I met him but started just before we lived together. We were together for about nine months when we were arrested. He had information, so was able to cut a deal to received leniency but I had no one to snitch on except for him. He was sentenced to only 9 years, even though he was far more involved. He was debriefed three times but they never were interested in talking to me or giving me a deal because he had all the information and he was the only person I knew. I guess they figured I had nothing to offer that he hadn’t already told them. I had four grand children who were five and three years old when I was arrested. My daughter was a single mother going to school and working. I had to leave her without help since we had no relatives in Dallas Texas. I’m very proud of her because she graduated from business college. My son has two children; one graduated this year and a daughter who is 14 years old. From the very moment I became incarcerated I gave my life to Jesus Christ. I have served him with all my heart and have translated for ministries for many years. I was also a praise dance leader until my sciatic nerve got bad. I enjoy helping others that are new to prison and warn them that here in prison the only sincere friend we have is God. I explain that who they hang with makes a big difference and it doesn’t take long to figure out who the trouble makers are and the people you should avoid. Staff members judge inmates according to who our friends are. If we want to change for the best it’s critical to stay away from inmates that are constantly getting in trouble. I get together with my sisters in Christ and older people that are educated so that I can learn something I don’t know. I don’t waste my time with people that don’t want to evolve and better themselves. I am bilingual and have composed about 30 songs in Spanish for the Lord. I talk to Him through songs praising his Glory even though I received a 27 year sentence – I recognize that there is good in every situation. I have to be strong and brave but at the same time humble so that inmates can see love in me and trust me to help them. What can I say, I could write a whole book of all the things that I have seen, felt and done in here. I pray that the 22 years I have already served will be considered sufficient for my role in what occurred, especially since those who were far more involved are now home. I am 63 years old and the balance of my life is moving toward the shallow end, so I pray that I will be reunited with my children soon. ← Michelle Miles – 30 years – Received Clemency on 5/5/2016 after 19 years! 47 queries in 1.130 seconds.